"A Dell PC rental is one of our customers top picks. When ever we receive a call for a PC rental 9 times out of 10 they ask what type of Dell Desktop should I rent. Dell's Desktops are so well known for their reliability and ease of use that it is a no brainer to go with a Dell for your next PC rental." 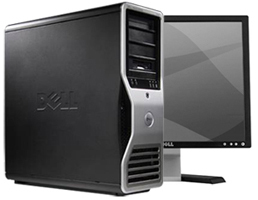 Why Rent A Dell Desktop PC?. A Dell computer is one of the easiest, safest, and cheapest renting solutions we have. We have a wide variety of Dell PC’s for you to choose from to guarantee you get the right Dell for the occasion. Dell is known to have some of the worlds most reliable computers and whenever you do come into a problem they have top of the line customer support to help fix your problem fast. All of our Dell Computers for rent are fully customizable. We let you fully customize your computer rental to fit your needs. Need a specific program or software installed on your computer, no problem we will have it all done and ready so that when it arrives all that will be left is to turn it on. The Vostro Desktop series is dell’s first pc aimed directly at small businesses. A Dell Vostro Desktop comes with no unwanted Trialware that slows down your computer, an easy to use 10GB online back-up solution, and a 24-7 tech support that is specifically trained to handle problems with Vostro Desktops. When you receive your Vostro Desktop you can guarantee an easy set-up procedure that takes minutes instead of hours and a reliable computer that comes at a cheap price, but has the right power for your business needs. Dell’s Optiplex system is the perfect business line desktop. Its small form fit factor means it can fit in any size workstation and its discrete design makes the new Dell Optiplex Business computers in a business class of its own. A Dell Optiplex also comes with a wide variety of choices when it comes to size, harddrives, cpu’s, etc. making it a great desktop that can be made specifically for your needs. If you are looking for the best business performance desktop then the Precision Desktop is the one for you. Dell’s Precision Desktop is a top of the line Business class computer that is capable of handled hungry business application with ease. Precision Desktops also support a Quad Core CPU, making it the perfect choice for business who’s computer are always bogged down by multiple processes. A Dell Server has always been the best option. The fact is there is no better servers than Dell. If you are looking for a reliable, cost effective, and outstanding performance server then where else can you turn besides Dell. We also offer Apple, HP, and Compaq Computer Rentals.